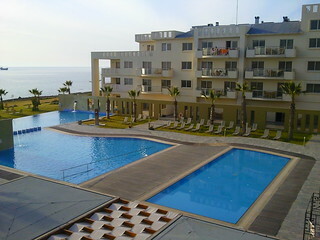 If you’re planning a holiday in the Paphos area of Cyprus, I’ve two recommendations for 4 star hotels, based on our trip to the island in March 2010. I selected 4 star hotels where you could stay in a one bedroom sea view apartment on a half board basis that had received good reviews from guests. 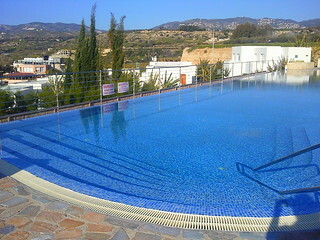 This hotel is located about half way between Paphos and Coral Bay. There’s an infinity pool in the grounds. The free wifi in the lobby had a very good signal. Our apartment had a large balcony with sea views. 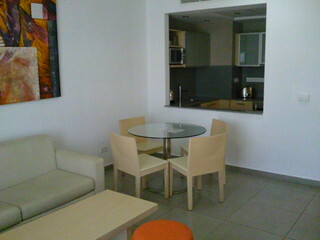 The apartment was comfortable and clean. The buffet breakfast was really good with a wide choice of items. However, some of the meat main courses at the evening buffet was pretty fatty and/or chewy, the fish dish was more reliable. In summary considering we paid around £50 a night to stay in a one bedroom apartment with two meals a day, it was excellent value for money. I don’t really think the hotel merits four stars. 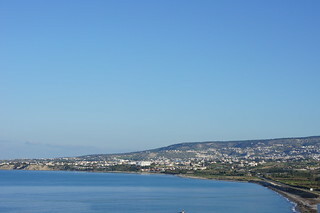 This hotel is located on the fringes of Paphos, near the Tombs of the Kings. It has an outdoor infinity pool and an indoor pool and spa. 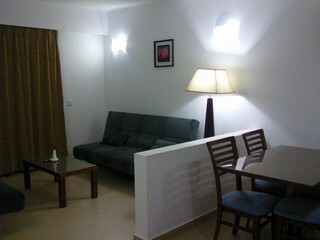 Our one bed apartment was really luxurious and even had two bathrooms. The kitchen had a full size cooker, washing machine and dish washer. I loved the apartment. The selection of food at the buffet breakfast and dinner was not as extensive as at some four star hotels but it was very good quality, if a little bland at times. 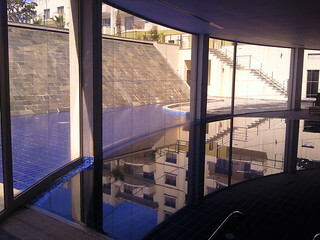 I used the steam room and sauna, which is free of charge to guests and had a swim in the indoor pool. In summary the Capital Coast Resort was more expensive at around £70 a night but given the standard of the accommodation, still excellent value for money.